I’m sat in a garden right now, and it’s really quite pleasant. The only sign of impending terror is the suspiciously granular birdsong which might – might – herald an incoming android patrol a la Sir, You Are Being Hunted. 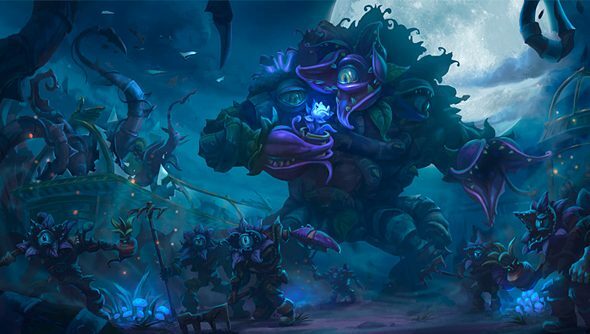 The triumphant Heroes of the Storm is much more upfront about its horticultural horrors. When night falls on its new three-lane battleground, the creatures of the night will come out. Garden of Terror is subject to a day/night cycle controlled by players. Day will naturally roll into dusk, and all normal mercenary camps will be replaced by night horrors – displayed as purple dots on the minimap. Players will need to kill all of the horrors to end the night sequence. Given that nightfall changes the nature of the map and the vision of players, ending or sustaining the night will become a strategic consideration for both teams. One map objective will see teams collect seeds from sentient plants both large and small throughout the garden. Once they’ve gathered 100, one player can transform themselves into a very large, singular Garden Terror for a limited time. The Garden Terror has plenty of health and power, plus two abilities: a chance to disable and damage all enemy buildings in the casting area, and an AOE attack for polymorphing enemies into “slow, weak Plant Zombies”. It sounds like lots of fun, and all committed to the game in flagrant disregard for the conventions of MOBA maps. Speaking of which: have you taken in Heroes of the Storm’s talent system yet?